Rewards Canada: TD First Class Visa Infinite: 40,000 Bonus Points and first year free! 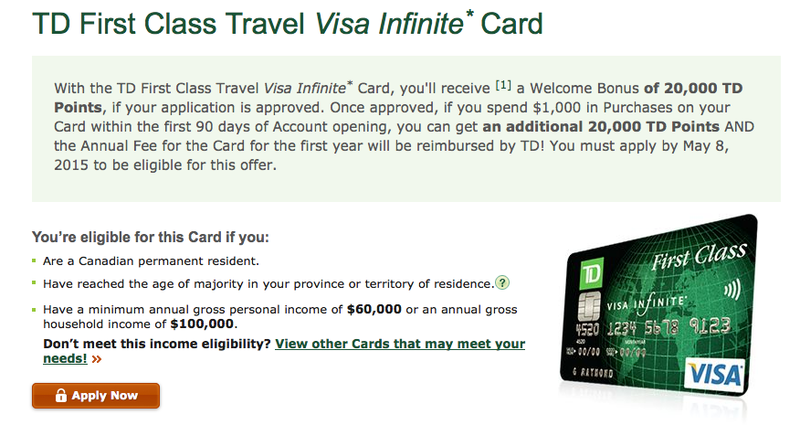 TD First Class Visa Infinite: 40,000 Bonus Points and first year free! TD must have seen a drop off in applications for their proprietary card when then launched the TD Aeroplan Visa Infinite Card - 25,000 Bonus Aeroplan Miles and First Year Free back in January as now they have increased the sign up bonus for the TD First Travel Visa Infinite Card to 40,000 points and no annual fee in the first year! The 40,000 worth $200 in travel is awarded in two parts: 20,000 upon approval and 20,000 more points when you spend $1,000 within 90 days of activating the card. The first year free is a nice incentive seeing that many of this card's direct competitors offer or have offered the first year free. This card, while only achieving fourth place in our current Top Travel Rewards Credit Card rankings is still a great card for many giving a minimum of 1.5% back to you when you redeem for any travel anywhere (you don't have to book via TD). Even at 9 points it is a great deal. It equates to a 4.5% return! That's very hard to achieve on any card! TD is going to change the redemption value from $50 to $40 for every 10,000 points as of mid august 2015. Just de-valued all my bonus points for getting the new card bc apparently it won't be given til Sept. Very disappointed. Will be looking at changing cards again.